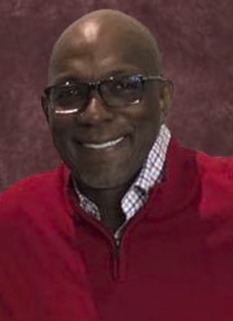 Karl Malone spent his first 18 seasons (1985–2003) as the star player for the Utah Jazz, forming a formidable duo with his teammate John Stockton. 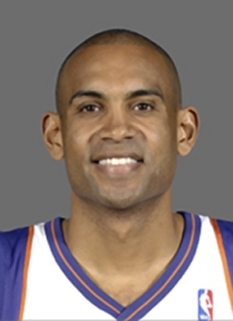 He played one season (2003–04) for the Los Angeles Lakers before retiring. 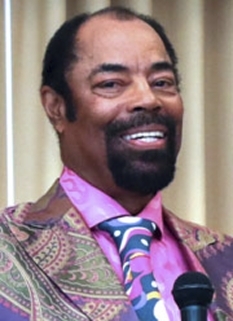 Born in Summerfield, Louisiana, he was nicknamed The Mailman in college for his consistency ("the mailman always delivers") and his work in the post. Malone twice won the NBA Most Valuable Player award. 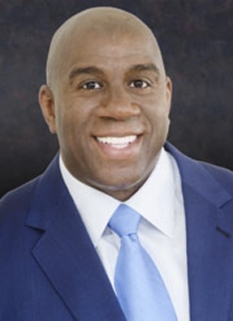 He is generally considered one of the greatest power forwards in NBA history and has scored the second most points (36,928) in league history, trailing only Kareem Abdul-Jabbar. 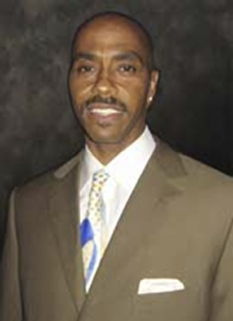 Malone was chosen by the Jazz in 1985 out of Louisiana Tech with the 13th overall pick in the draft. He averaged 14.9 points and 8.9 rebounds in his first season. At the same time, reserve point guard John Stockton was winning the trust of the coaching staff and the love of the fans. 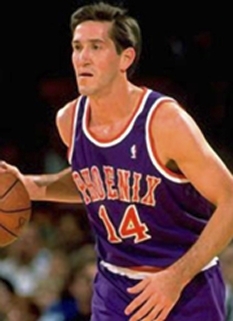 By the 1987–88 season, Malone was the foundation of the offense and Stockton was the floor general. 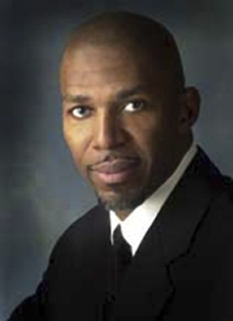 Malone made his first All-Star Game in 1988 on the strength of 27.1 points per game, and made his first All-NBA team at the end of the season. This was the first of 14 consecutive All-Star appearances for Malone. During the 1996-97 season, Malone put up an impressive 27.4 points per game while leading the Jazz to a 64–18 record, the highest win total in Malone's 12 seasons with the Jazz. The Jazz had the best record in the Western Conference and the second-best in the league, with Malone winning his first MVP award. In the lockout-shortened 1999 season, Malone won his second MVP award and the Jazz went 37–13. They lost in the second round to the Trail Blazers, and for the next several years the Jazz fell out of title contention. Despite the decline of his team and his advancing age, Malone averaged 25.5, 23.2, 22.4, and 20.6 points per game in his last four seasons with Utah. In the 2002–2003 season, Malone passed Wilt Chamberlain for second on the all-time scoring list with 36,374 points. He became a free agent in 2003. Malone played in the NBA for one more season, joining the Los Angeles Lakers in an attempt to win a championship, the only major achievement absent in his career. His bid failed as the Lakers were defeated in five games by the Detroit Pistons in the 2004 NBA Finals. 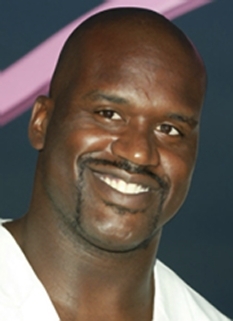 He collected two regular-season MVP Awards, eleven NBA First Team nominations and was also selected to the NBA All-Defensive Team three times. 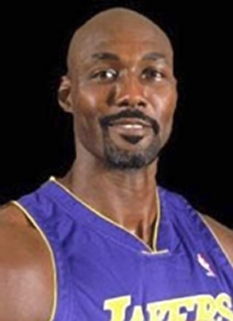 DISCLAIMER: PFP Sports Talent Agency does not claim to represent itself as the exclusive agent for Karl Malone. PFP Sports Talent Agency is a booking agency that represents organizations seeking to hire pro athletes and sports personalities such as Karl Malone for speaking engagements, personal appearances, product endorsements and corporate entertainment. Fees on this website are estimates and are intended only as a guideline. Exact fees are determined by a number of factors, including the location of event, the talent’s schedule, requested duties and supply and demand. PFP Sports Talent Agency makes no guarantees to the accuracy of information found on this website and does not warrant that any information or representations contained on this website will be accurate or free from errors. We are often asked how can I find out who is Karl Malone's agent? To find Karl Malone appearance fees and booking agent details, you can contact the agent, representative or manager through PFP Sports Talent Agency for speaking fee costs and availability. PFP Sports Talent Agency can help your company choose the ideal sports personality for your next marketing campaign. To hire Karl Malone for an appearance, speaking event or endorsement, contact Karl Malone's booking agent for more information.